.Anti-glare driving glasses help reduce light that causes eye strain, means that these night driving glasses can block sharp glare from headlights, street lights, and traffic for ultra-clear vision, improved driving focus. 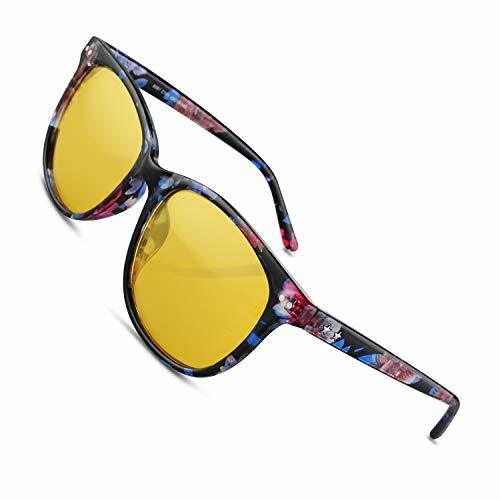 .HD POLARIZED YELLOW LENSES - Yellow Lens Glasses for Night Vision Lens is perfect for usage by driving. Especially at rainy day / foggy / night. .How to tell if your glasses are polarized? We have a polarizing test card. When you wear our glasses, you can see the hidden picture, which indicating that the lenses are Polarized. .SUPER COMFY TO WEAR - lightweight simple design, Bokewy will remain scratch-free for a long time. The pc frame is lightweight, sturdy, and will grip the lenses snugly! .100% MONEY BACK GUARANTEE & LIFETIME WARRANTY - 90 Day refund and lifetime Warranty on Frame & Lens. ensures this will become your favorite no-risk purchase, give you a best shopping experience. The highest car crash rates occur at nighttime. The headlights from oncoming traffic make it difficult to drive at night or dusk. The glare can easily blind a driver for few seconds. Packed with tough case to protect sunglasses well. Effective Against the Strong Light and Enhance Driving Safety at Night. Perfect for night driving or Other Outdoor Sports(Especially at Night). Fashion and stylish design cool sunglasses. How to recognize POLARIZED night vision glasses? - Before you wearing our glasses, the car pattern on enclosed polarized test card is hidden, while with our glasses the car is visible. Frame bigger than you expected. Night-vision glasses means reducing glare rather than eliminating glare.